I love having parents who are so crafty. I always benefit from what they find that they think would be great for their grand-daughter (my daughter, Savannah). This happened during our local shop hop last year. We found “Bugsy” by Kids Quilts and it was perfect for Savannah’s room. I was so excited to have a new project, I was ready to head home and see what my mom had in her stash for this quilt. I never did get to her stash, at another shop on the shop hop we found the perfect boarder fabric and some great batiks to match it. I had some other projects to finish before I could really get started, but once I started I had a hard time putting it down at the end of the day. Now, a little over a year later, I am ready to send it to a quilter. 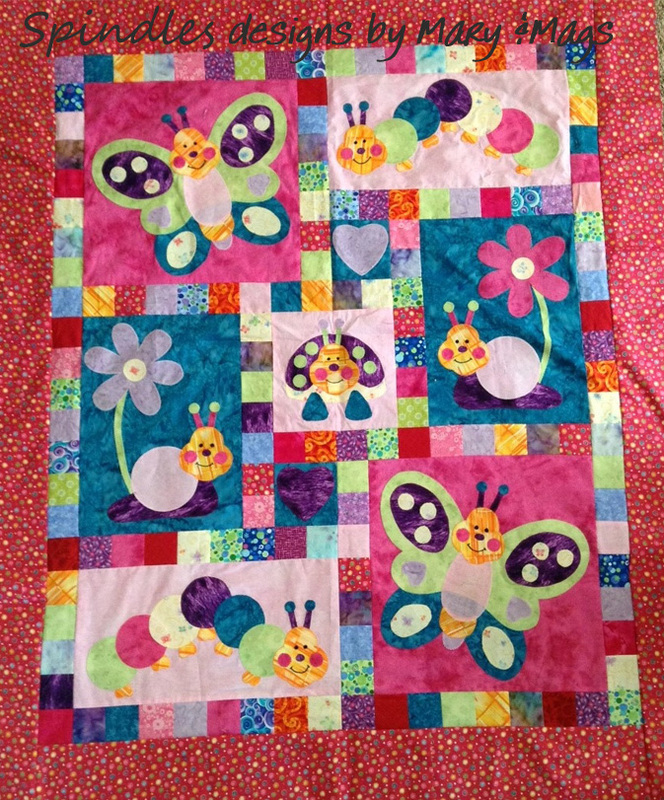 I enjoyed working on this quilt with all its bright colors and adorable smiling bugs! 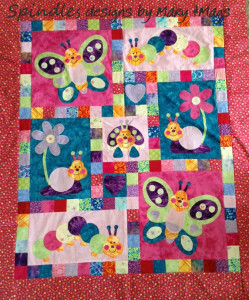 I am planning on hanging it on the wall in Savannah’s room once it is quilted. I finished the top a few months ago and have been waiting to find the perfect back for it. During this years shop hop which ended a couple weeks ago, I found it. 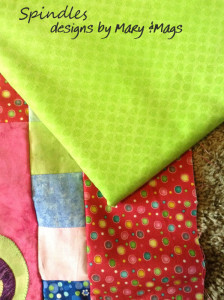 Bright green and I cant wait until I get it quilted. I am planning on having someone else quilt it, as I have only just started learning how to quilt on my sewing machine. (That’s a story for another day.) I will get more pictures of the quilt once it’s finished and on the wall.